I couldn’t resist making another flag snack this Labor Day weekend. However, this time I wanted to change-up my old “go to” flag recipe. I envisioned a smaller flag using raspberries for my red color. It worked out great. There is nothing easier than making these kabobs. I must admit that I think this smaller version is prettier. This all American treat is always a favorite with the kids too. Take five skewers/sticks and thread two raspberries, two marshmallows and four blueberries. Follow pattern. Take seven more skewers/sticks and add four raspberries and three marshmallows. Follow pattern. Arrange on a platter or dish. The original Festive Flag recipe can be found on this blog http://wp.me/p3uZx8-U. It’s a bigger version using strawberries. 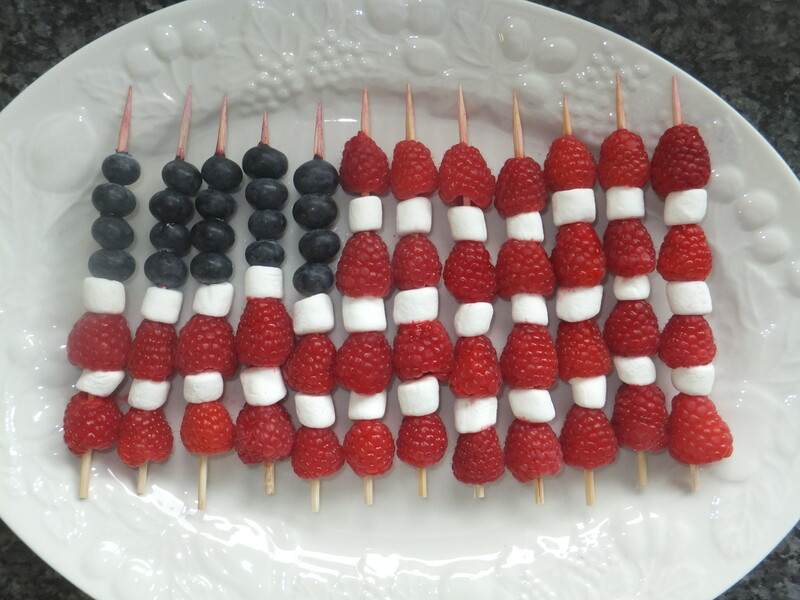 You pick your favorite patriotic snack.